JEJU -- For many Yemeni asylum seekers on South Korea’s southern island of Jeju, obtaining medical treatment and finding places to stay are the most challenging tasks they face daily. 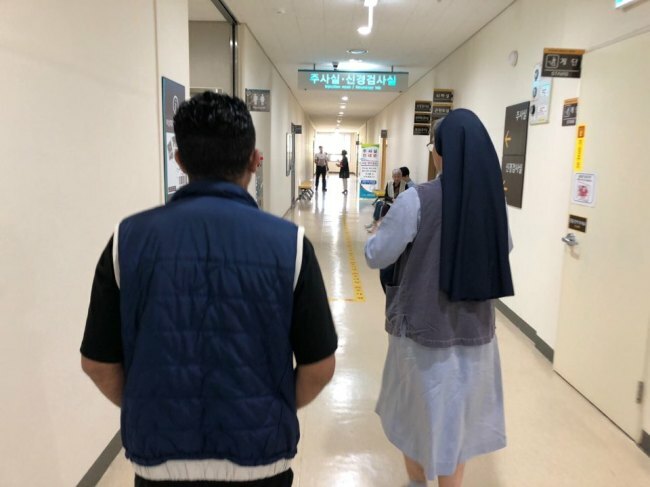 To help these asylum seekers who fled their war-torn country thousands of kilometers away, Sister Cristina Evelina Gal from the Naomi Migrant Pastoral Center of Joongang Cathedral of the Jeju Diocese works day and night to take those who are ill to hospitals and deliver goods they need. Sister Cristina, 41, came to South Korea as a missionary from Romania in 2007. Before coming to Jeju in December, she helped migrants and expats living in Guri and Anyang in Gyeonggi Province. About seven months have passed since she arrived on the island and she has been the busiest in her life ever since. There are not enough hours in a day for her to attend to the requests that continue to pour in, she said in an interview with The Korea Herald in Jeju on June 21. On the day of the interview, Sister Cristina drove from Jeju City to Seogwipo City in the early morning, taking a Yemeni to a hospital and six others to a nearby medical center, while taking calls from people wishing to donate and other asylum seekers requesting help. This has been her daily routine for the past months, she said. “There are people who oppose the Yemeni asylum seekers staying on the island here, and that is understandable. But these people (Yemenis) have painful memories, and if we open up our minds a little bit, I believe there will be less conflicts and problems,” she said. 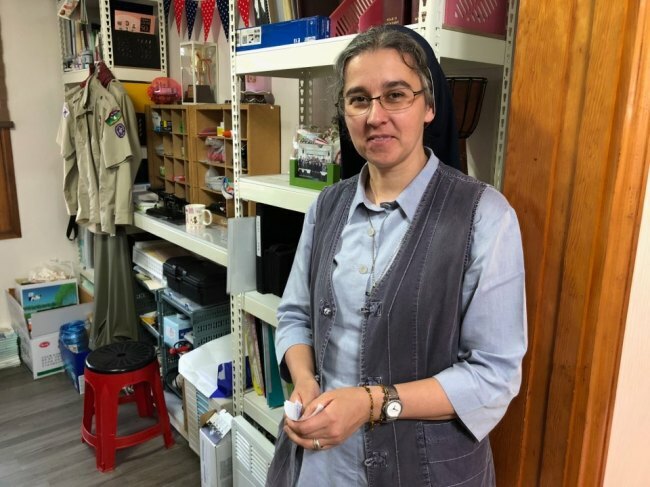 Before coming to Jeju, Sister Cristina worked in Guri and Ansan, for one year and seven years, respectively, at special shelters to help migrant families and immigrant marriage women. The problems she frequently encountered were related to domestic violence the foreign-born wives suffered or the discrimination children faced in schools and in society. From her past working experience, Sister Cristina said she realized that the categorization of “damunhwa” families, or multicultural families, is the very source of discrimination, contrary to the original intent. But the word now appears to give the impression that it refers to a minority group, she explained. In addition, as the policy in the beginning focused mainly on providing material and financial support for migrant families, it also gives the impression that multicultural families are often in needy situations and are inferior. As a result, many Koreans appear to think that families referred to as “damunhwa” are often from poorer countries, she said. Policies have their flaws as well. It was very strange for Sister Cristina to see a parking lot designated for drivers with migrant backgrounds at a state institute. The parking space had “damunhwa” written in big letters in white, similar to parking spaces reserved for disabled people. “Imagine how it would be like for Koreans to be punished for accidentally parking there. They would think of it as reverse discrimination. Such policies can actually plant ideas that migrant families and expats are not only different, but also are given privileges,” Sister Cristina said. Promising to devote one’s life to God is not an easy decision to make. And moving to a country some 8,000 kilometers away -- alone -- to help people may be an extremely difficult choice. But Sister Cristina has taken what many may think is a difficult route, with her deeply rooted belief in God. She was born into a Catholic family in 1977, when the Marxist-Leninist communist regime oppressed religion. Until the communist rule officially ended in 1989, many priests and nuns were forced out from monasteries and convents, or faced violence, she explained. In her younger years, it was difficult for Catholics to be open about their faith, and it was a rare for priests and nuns to wear their habits in public. Still, her parents took her to a church in Bucharest, where she was brought up, and there, she saw habits worn by nuns for the first time in life. In her teen years, she did not know what she would do with her life, and she consulted an acquaintance about getting married. But the person’s answer shocked her, and made her realize her deeply rooted devotion to God. “The person told me it would become more difficult to fully give faith to God if I married, because I would have to take care of the husband and the household. And the thought weighed on my mind,” she said. When she turned 19, she was determined and she went to Austria to join the Missionary Sisters Servants of Holy Spirit. After being trained for about 10 years, she was dispatched to South Korea. Speaking in fluent Korean throughout the entire interview, she said she feels like a foreigner when she goes back to her home country. “When I am go to Romania for my holidays, the country appears a little unfamiliar to me now. I also do not have as many friends there as I have here,” she said. For her, a trip home comes once every three to four years, for about two months. While there are many dispatched missionaries going back to their home countries after serving for years, she said she has no plans yet to go back. “Koreans are generally warm people. I feel God is always here to look after the people, and I think I will stay here until God wants me to,” she said.